Nordic design has become a bit of an obsession. White-and-gray palettes. Cozy throws. Wooden beams. Leather accents. Paper lanterns. Carefully chosen pops of color. Storage as decor. High-end bath products. Tech-free spaces. Wild artwork. It manages to feel chic and comfortable at the same time. You wish your apartment could look like this. But you have too much difficulty parting with the knickknacks you’ve accumulated over the years. So you travel to minimal hotels to fulfill your craving. Your next destination should be Wanås (pronunciation: Vanoos) in South Sweden. The estate is home to a 15th-century castle, which was burned to the ground (and later rebuilt) during the Northern Seven Years’ War. The remote property was turned into a sculpture park in 1987. It now houses 70 permanent sculptures and installations from artists all over the world. Organic gardens and beech forests fill the rest of the land. As of last spring, a hotel does, too. 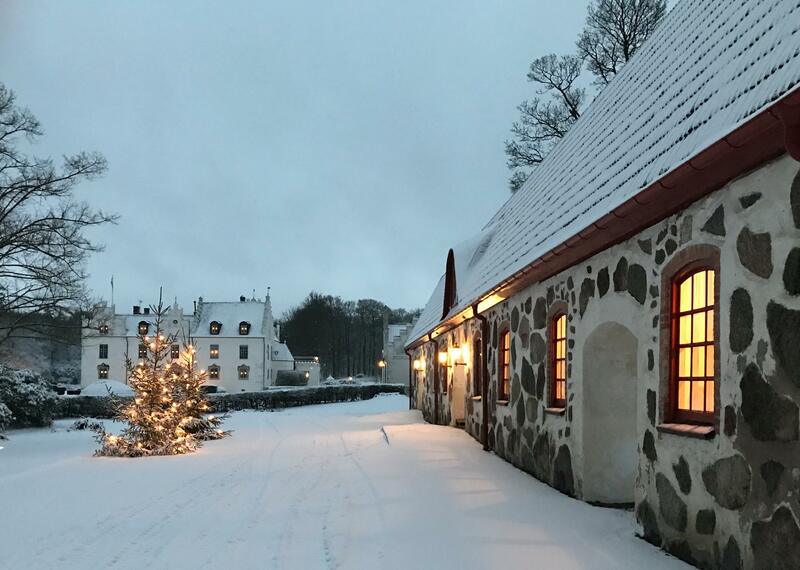 The estate’s 18th-century farmhouse is now Wanås Restaurant Hotel. The exterior—with its original stone walls—looks historic. The interior retains a few antique features. There’s a marble fireplace in the lounge, salvaged oak stairs leading to the second floor, and vintage tiles in the bathrooms. The rest of the space is completely modern, though. It’s evident as soon as you enter the hotel. 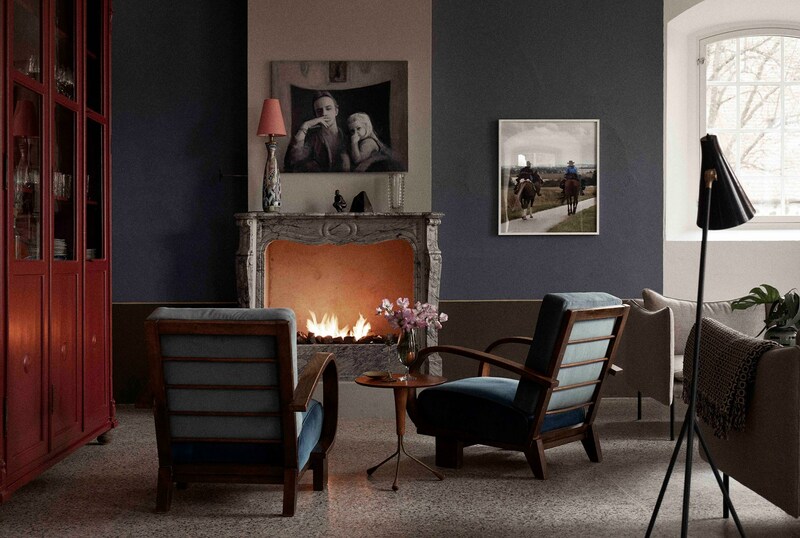 Besides the old fireplace, there are terrazzo floors, custom-made furniture, and large photographs in the lounge. The mudroom is stocked with Stutterheim (a Swedish company) raincoats and Hunter boots for you to wear around the property. The 11 guest rooms are individually decorated. Each features white linens and a wool blanket draped over the corner of the bed. There’s an exposed closet, a leather luggage rack, and floor lamps. While red chairs and large paintings brighten the otherwise neutral room. Also, remember that it’s not just a hotel. There’s a farm-to-table restaurant on the first floor, as well. The kitchen is open, so you can watch what goes on behind the scenes. You might see organic milk being strained to make ricotta, wild boar being stuffed into sausages, or tomatoes being cooked for chutney. The milk, the meat, and the vegetables come from the estate’s farm. Plus, in true Scandinavian fashion, berries, mushrooms, and game are foraged from the surrounding forest. So pull on a pair of boots and bundle up in a raincoat to head outside. You’re in search of Jacob Dahlgren’s Primary Structure, Kari Cavén’s Cow Chapel, and Yoko Ono’s Wish Tree for Wanås as you wander around the property. There’s no rush. As a guest of the hotel, you can explore long before or after the sculpture park opens or closes for the day. Fika—picture England’s afternoon tea being replaced with coffee—will be served when you return. It seems like your Nordic obsession is quickly expanding to much more than design.